Genus: Prosthechea Knowles & Westc. Prosthechea cochleata is valued for the unusual shape of its flowers, which can resemble an octopus (albeit a five-legged one), and is common in cultivation. The name Prosthechea is taken from the Greek for appendage (prostheke), and refers to the appendage on the back of the column of P. glauca, which is the type species for the genus. The shape of the lip, with lines across it, can be seen to resemble a cockleshell. This species can be found in bloom most of the year. 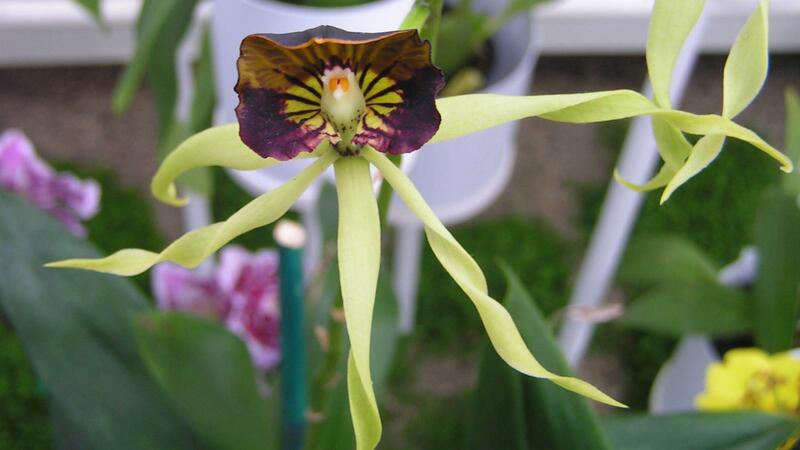 The cockleshell orchid is the National Flower of Belize, where it is known to residents as the black orchid. This species occurs throughout Central America, the West Indies, Colombia, Venezuela and southern Florida. Members of the genus Prosthechea are found at elevations ranging from sea level to 2600 m.
The smooth pseudobulbs of Prosthechea cochleata are oblong-discoid in shape. Each pseudobulb bears one to three linear non-succulent leaves, which are clasping at the base. The flowers with their dark hood-like lip and paler dangling sepals and petals, are borne on continuously growing racemes. The flowers are unusual in that they are held the other way up in comparison with the majority of orchids. Instead of being resupinate (twisted so that the lip is borne upside down) the lip is held at the top of the flower (non-resupinate). This species commences flowering in the spring and may continue for up to six months. This species is listed on CITES Appendix II, meaning that trade in this species is controlled to ensure its survival. Prosthechea cochleata is the National Flower of Belize. It is frequently grown as an ornamental for its long-lasting flowers. 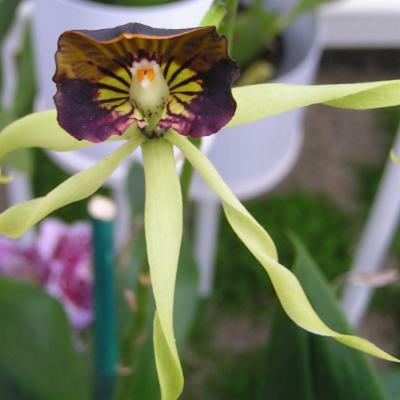 Commercial orchid growers have produced several interspecific and intergeneric hybrids using this species. Pseudobulbs of Prosthechea cochleata were used in Central America as a source of mucilage (a sticky substance used as an adhesive). Prosthechea cochleata is commonly cultivated for its unusual and dramatic, long-lasting flowers, which are borne on continually growing racemes. This species is cultivated in the Tropical Nursery (one of the behind-the scenes areas) at Kew. Plants are placed in pots which allow for a couple of years' growth. The Kew standard epiphytic orchid mix is used (three parts bark, two parts pumice and one part charcoal) as the substrate. Plants are watered and misted throughout the year, although less water is given when plants are not actively growing. Plants are given as much light as possible during the winter, but shaded from direct sunlight in the summer. The emerging flower buds can be prone to mealy bug infestation. Staking is necessary to obtain straight flower spikes, and to hold plants firmly after re-potting. This species can sometimes be seen as part of the Tropical Extravaganza Festival at Kew. The dramatic display around the central pond in the Princess of Wales Conservatory can include cockleshell orchids with their octopus-shaped flowers. The spirit collection, which is housed in the Herbarium (one of the behind-the-scenes areas of Kew) contains two specimens of this species. These alcohol-preserved specimens were collected by Kew staff on expeditions to Cuba and the Dominican Republic. The spirit collection can be searched using the Herbarium Catalogue. Epiphytic on trees in moist woodland and swamps. In tropical rainforest this species is often found between 2 and 20 m high on the vertical trunks of large trees, in a micro-habitat above other more shade-tolerant orchids. Not currently rated by the IUCN. Listed on CITES Appendix II. Nativa en Colombia; Alt. 350 - 1200 m.; Guayana y Serranía de La Macarena, Valle del Magdalena. Bahamas, Belize, Cayman Is., Colombia, Costa Rica, Cuba, Dominican Republic, El Salvador, Florida, French Guiana, Guatemala, Guyana, Haiti, Honduras, Jamaica, Leeward Is., Mexico Central, Mexico Gulf, Mexico Northeast, Mexico Southeast, Mexico Southwest, Nicaragua, Panamá, Puerto Rico, Suriname, Venezuela, Venezuelan Antilles, Windward Is. Hagsater, E. et al. (2005). Orchids of Mexico. Productos Farmaceuticos. p.89. Pridgeon A.M., Cribb, P.J., Chase M.W. & Rasmussen, F.N. (Eds.) (2005). Genera Orchidacearum, Volume 4, Epidendroideae (Part one). Oxford University Press. McLeish, I., Pearce, N.R. & Adams, B.R. (1995). Native Orchids of Belize. A.A. Balkema, Rotterdam. Luer, C.A. (1972). The Native Orchids of Florida. The New York Botanical Garden.